Kitsu Sells Yarn Tails, sometimes she has pre-made ones available for immediate purchase, but she also takes custom commissions. “FUR” RANGES FROM 2 1/2 TO 3 INCHES. Approximately 10 1/2 inches long. 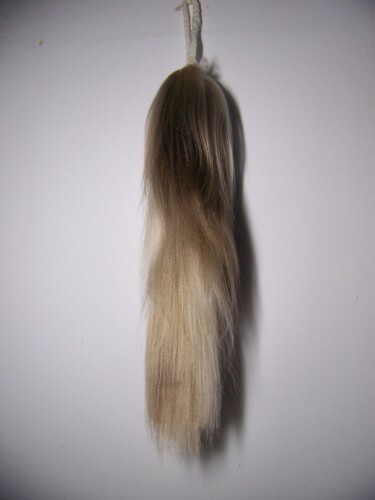 “Fur” ranges from 2 1/2 to 3 1/2 inches. Tails 2 & 4 were originally offered in THIS POST. To request a commission please contact me with a complete description (preferably with a drawing or other design reference of some sort) of the tail desired. Be sure to include length and as many other details like that. Kitsu will then provide a quote for the cost of the tail. If you agree to the project, after a down payment (In full for projects less than 50$, otherwise 50% of the finished cost) is received construction will begin. 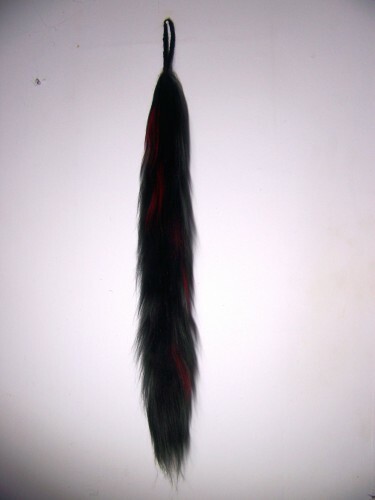 NOTE: If you are interested in buying your tail with Deviant Art points, Kitsu does have an account there and is perfectly happy to accept them at 80 points to the dollar exchange rate. Kitsu sells adoptables on her Deviant Art page, and you can find details about them there.